yesterday was a perfect day - of course every tuesday is perfect because that's the day ms. t comes over to play. however, yesterday was particularly perfect in every way. since we have been blessed with a string of days where the temperatures have been above freezing - in fact, yesterday it was down right balmy - the sidewalks are once more conducive to strollers. one thing we always do on tuesdays is attend a story program at the library. after the library program, when the sidewalks are navigatible ms t and I enjoy making our rounds around town. 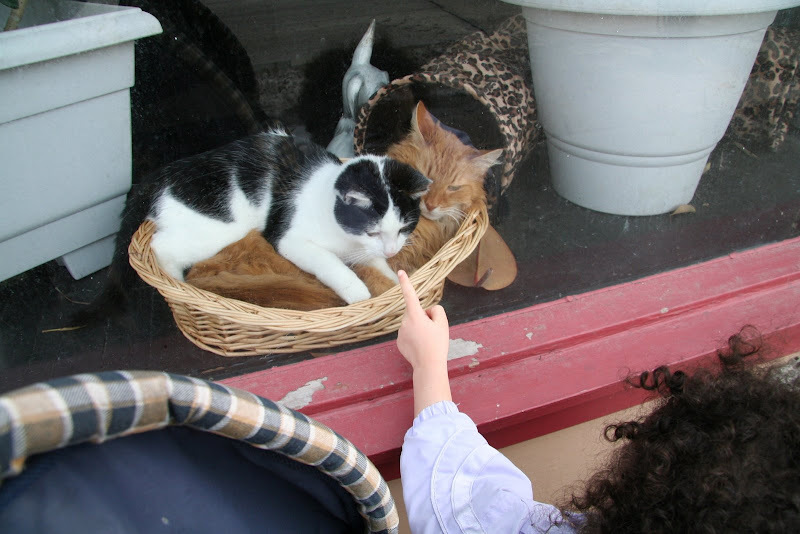 along with stopping at tommy's pastry for a treat, we always head over to see if chester and cheetos, the pretty coat junction store cats are in the window. and they were! 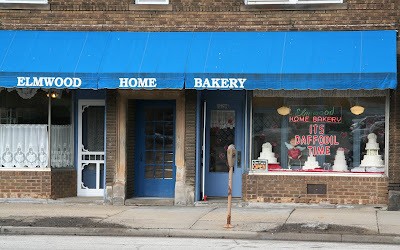 after we play with the cats (unfortunately yesterday there were no clients scheduled and we could only play with the cats through the window ) we pass the elmwood bakery. who needs groundhog day, you can keep track of the seasons by the elmwood bakery window. tomorrow is the 200th anniversary of the birthdays of abraham lincoln and charles darwin. check out dw of barking up the bodhi tree wonderful tribute to these great individuals. I particularly like dw's closing quotes! 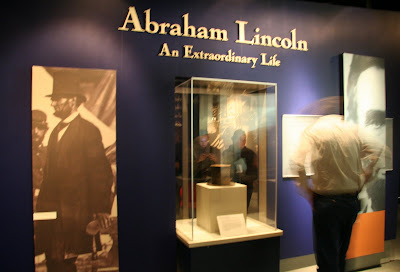 don't forget the special exhibit at the museum of american history on lincoln - you can take a virtual tour here. I'm sure many of us are familiar with the poster which asks the question about when will the military have to have a bake sale to buy a bomber. 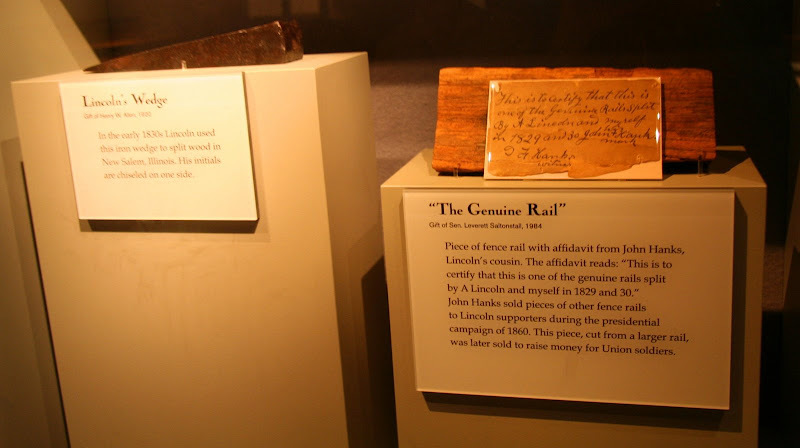 well apparently, in lincoln's day things were so tight that segments of the fence abe split were sold off to raise money for the union soldiers. hey, washington, are you paying attention? 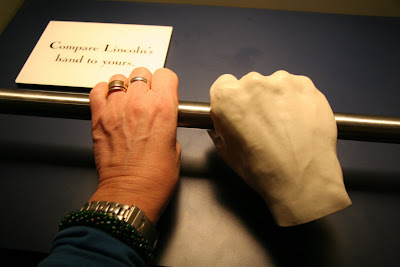 here's how my hand compares to lincoln's hand. oh tomorrow is also the birthday of reya at the gold puppy! happy birthday reya! mr rogers singing his opening song. if this doesn't make you smile, well, what can we say? i used to love to take my older son to storytime at the library! Nothing like a walk thru a city neighborhood or a town on a nice late winter (or better yet, early spring day). Love the post title. enjoyed the read at barking up the bodhi tree. Wonder how Darwin's father felt about his son's 'failure' later on in the game. Enjoy the weather and the time with the little one, kimy. Precious moments. i think I've seen that bakery in a movie... am I wrong? I've got to hand it to you, you post some fascinating photos especially the last one! Hanging out with little kids is great. adam - and I'm sure lakewood would welcome you back with open arms.... there's more than a few house for rent, sale...you name it! john - I am definitely a city mouse, although I do enjoy wanders to the country. lora - you have a keen eye and a good memory....I totally forgot! you are most correct this is the bakery that used in american splendor the movie about the life and trails of cleveland's own harvey pekar! dd- no, I gotta hand it to you you are too punny!!!!! as - oh my god that is the best!!!!! meow meow gojira meow meow!!!!! megan - thank goodness for reruns and pbs, mr. roger will live forever!! I love mr. rogers. I tried to see his red sweater at the smithsonian's museum of american history but they weren't displaying it when I was there in january..... I was quite bummed - but I did get in a nice visit with kermit and oscar! My 5 & 11 year old both have library cards...and they use them. It's their favorite place. It started for both of them with story time at our neighborhood library. Maybe it's also because it's their parent's favorite place. We don't have a nice bakery to stop off at though. 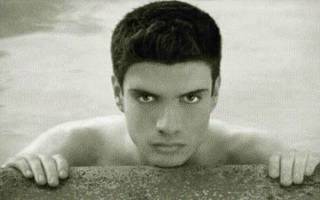 Envy. I want to go on a walk with Ms. T! Thanks so much for the kind praise, mouse! Those two guys were special. What a nice little jaunt! Too bad Chester and Cheetos were behind glass. It was a nice day here, too. I went chasing a couple of shots for Theme Thursday. sent you a snail mail today but it was not a proper letter, I promise something better soon. Dennis doesn't like to be pointed at. I'm glad you were able to get out and about with ms t. Whenever we go to the States I take my boys to library activities. The US public library system is truly a wonderful thing! Abe Lincoln is one of my fav presidents. I heard he suffered from major depressive disorder. Poor dude. Reminds me of me. AHAHAHAH! Hey, not bad though, for someone who probably did not expect to become so amazing in life, and all that good ole' Abe achieved is pretty remarkable. I hope Spielberg makes the movie starring Liam Neeson and Sally Field as Mary Todd Lincoln. Is that Ms. T's sweet head I see?